In the 1960s and 1970s, cold and hot wars were fought to push the idea of benevolent capitalism – believing that creation of wealth at the top of the pyramid would ‘trickle down’ and eradicate extreme poverty across the world. That did not happen. Since the 1990s, the mantra of globalisation has been that high rates of economic growth will greatly reduce the incidence of poverty worldwide. That has not happened either. In reality, the globalised world economy has deeply fragmented production processes, labour markets, political entities and societies, creating a plethora of interest groups and lobbies which have undermined the integrity of civil society and its rights and entitlements across the world. This is becoming increasingly visible in rich and poor countries in the form of growing disparity between places, people and groups. In particular, it is manifested in much greater income inequalities. 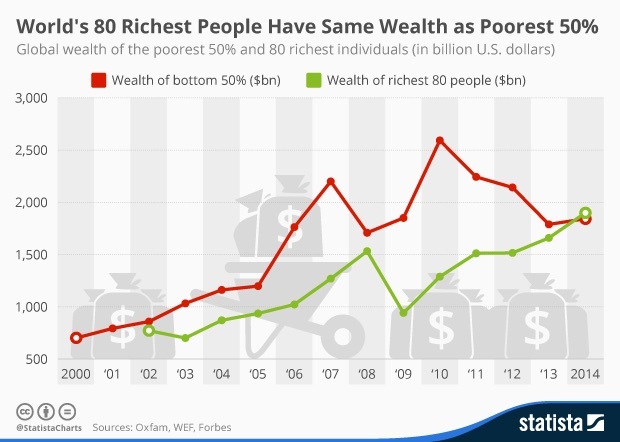 The wealth of the one percent richest people in the world amounts to $110 trillion. That’s 65 times the total wealth of the bottom half of the world’s population, which owns the same as the richest 85 people in the world. The richest one percent increased their share of income in 24 out of 26 countries, for which Oxfam have data, between 1980 and 2012. 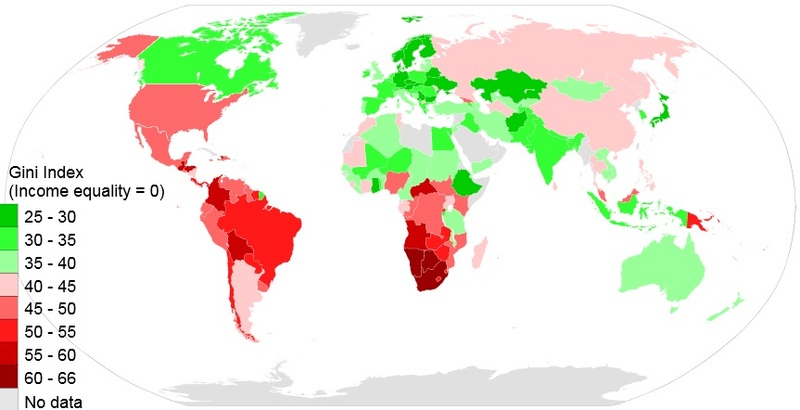 It is interesting to note that out of the BRICS countries in the above graph, South Africa demonstrates the highest inequality of incomes, perhaps a reflection of its largely natural resource based economy (gold and diamonds), which has traditionally been developed by a rich white minority during the long years of apartheid. Brazil too has a long history of military juntas which allowed a class of the super-rich with immense land holdings to flourish. It is only recently, that concerns of the poor have moved centrestage in Brazilian politics, and with the re-election of President Rousseff, are likely to remain there. The growing disparity in China is indeed a surprise, especially because it is the last surviving communist regime of any consequence in the world. Perhaps the unnaturally rapid urbanisation and industrialisation in a traditionally agrarian society has allowed individual entrepreneurs to accumulate immense fortunes in a relatively short period of time. 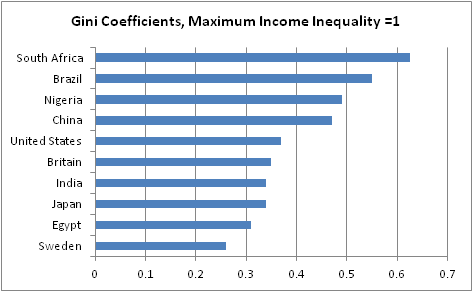 The majority of the countries in the world have a Gini coefficient between 0.3 and 0.4. In the case of developing countries like India and Egypt, it is a reflection of the growing middle class post-globalisation; while in the case of USA and UK, it is a testament to their relatively secure health and income safety nets, which prevent extreme deprivation and hardship in the population. News just in: A Credit Suisse Report says that disparity is growing rapidly in India, with the top 10% now holding 74% of the country’s total wealth, while the bottom 10% hold just 0.2%. The share of the top 1% (nearly half the country’s wealth) has always been lower than the share of the global 1%, but is now growing faster than the rest of the world. Yet Indians make up nearly 20% of the world’s poorest 10%! Not surprisingly, Sweden repeatedly tops the charts for both highest Human Development and lowest disparity, clearly demonstrating the inverse relationship between disparity and human well-being. Going by the experience and the professed policies of the new government in India, is any of this likely to happen soon? I think not. Maybe after 5 years, the most tangible legacy of this government will be an India with a higher Gini coefficient.